Following the sacking of Unite union convenor Rob Williams at the Swansea Linamar plant, other workers have voted to strike to have their colleague reinstated. It is understood that turnout for the vote was 88%, with 139 voting 'yes' in support of the strike, and 19 voting 'no' against it. "This is a marvellous vote in the teeth of mass intimidation by the Linamar management who have threatened the workers with the sack in the past if they took strike action to get Rob his job back. They are saying clearly in this vote that they will decide who they want as their convenor and not management. "The vote by secret ballot under the onerous anti- union laws and in the face of an unprecedented recession in the car industry is a real indication that the workers know that what is at stake is not just Rob's job but their very future, will they be able to have proper trade union representation or will they be forced to work under the dictates of the bosses with no rights to speak of." Williams was originally sacked on 28 April due to an "irretrievable breakdown of trust". Bosses at the Linamar plant were said to have forced him off the premises after he had locked himself in his office, refusing to leave. Rob was initially called back to work, but later that week was sacked for good. The workers have indicated that they will go on an indefinite strike until Williams is reinstated. Williams was recently in Belfast speaking to members of the Socialist Party (of which he is a member), and other members of Belfast trade unions and political groups, as well as sacked traffic wardens. 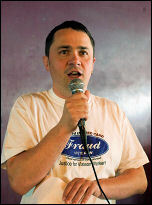 Williams, vice-chair of the NSSN, is scheduled to speak at their conference in London on 27 June . Indefinite, and all out. That is a very good result, and a real testament to these workers prepared to lose out financially to a significant extent to defend a colleague. Best of luck! yep, they'll need a tonne of support outside too!!! Excellent. Anyone know what proportion of the workforce are union members?